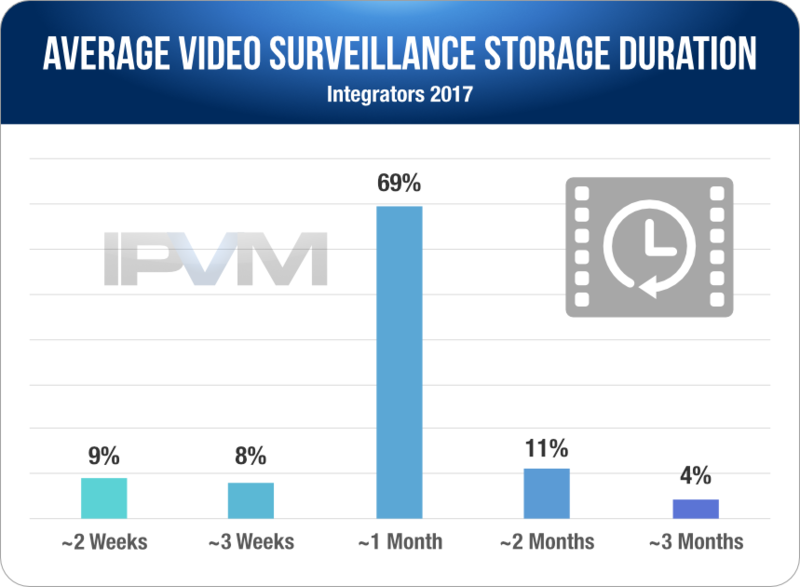 IPVM statistics show that 1 month duration for video surveillance storage is, by far, the most common used. However, in contrast to 2012, there was a significant decrease in the amount of systems using 2 weeks of storage, with many shifting to 1 month or longer. On the other hand, average storage duration overall is not going up significantly, with many respondents making it clear that 1 month is typically more than enough, regardless of storage costs. In this note, we break down the statistics and integrator's explanation for storage duration decisions. In a survey of ~150 integrator respondents, nearly 70% report average storage duration of ~1 month, with a roughly equal number averaging more or less than that. "30 days seems to be the standard. If there is some other reason for needing more or less it is usually related to some type of regulatory standard that requires more than 30 days." "Perception of commercially appropriate recording speeds and storage durations." "For general, unregulated industry there doesn't seem to be a strong rationale for wanting more or less than 30 days." "Most customers have corporate standards of 30 days. Some customers have higher requirements due to specific industry standards or compliance." "We recommend at least covering your maximum length of out of office time and coverage for the average time it takes for a service technician to respond to a request considering you may need to realize something has occurred." "Most people say 30 days, but admit that two weeks is probably all they really need to determine that an incident has occurred so they can review/offload associated video." "Instead of asking how long a client would like to store video on site, I ask how long it would be before an incident is ether reported and or an incident was observed. It's typically within a few days. The longest period stayed is about a week. By doubling that the client is able to retrieve most video of most incidents then export to other storage medium or back up location." "For many, it's a shot in the dark, but we typically try to guide them down a path of understanding how much is necessary from an incident standpoint. Larger organizations tend to find out later if there's been a less obvious incident, while smaller companies usually know right away if something happened. With storage costs dropping and compression improving, longer retention periods are just more attainable, and customers usually want more than less." "Cost to the customer/budget or the nature of the customer's requirements. Financial institutions & some Hotels require longer storage (days) and require continuous recording in certain areas." "Local regulations limits at 30 days (in most cases)"
"In Kuwait, new government regulations mandate 120 days storage." "There are some people who have to have 30 days because of some regulation or policy... those people don't seem to buy up over the requirement." "Some storage requirements are driven by mandate. For example Colorado marijuana laws dictate 40 days of storage and Washington state law dictates 45 days of storage." "We do a lot of healthcare sites and 30 days is mandated by the health authority. We use this as a matter of course for most of our other sites." "At present we are limited to the NVR manufacturer in the way that they write to the HDD's and also the cost on the size of the HDD from the manufacturer. We try to keep the system in one piece of iron, rather than a few." "With hard drive size now 4 TB and much larger it can be much easier to set a 60 day standard , however raid options and other factors like physical rack space may change the requirement"
"The biggest limiting factor (as with all security items) is the cost involved. For most places once they get to an enterprise server the cost of additional storage is low, so we go with lots of storage; for small installs though many of those servers have a hard time with lots of storage (usually they only have 1-2 drive bays) so there is a limiting factor there." "We generally use 4GB [Note TB] 3.5 surveillance hard drives, 4 per server. These have the best cost/capacity right now, I expect to switch to 6GB [Note TB] hard drives sometime this year. Our VMS server for smaller jobs holds 4 drives, we have no problem hitting 30 days retention, even with hard drive redundancy." Many DVR / NVR appliances only support a limited number of hard drives internally (1 and 2 being common for smaller systems). This can constrain storage duration, especially given the low cost of those appliances and the extra cost of expanding beyond them. "EndUser budget. Cost of TB and Servers"
"Mostly smaller systems so cost factor"
"Cost is always the main factor. Most of the systems are utilizing some form of RAID and we do not use consumer level hard-drives." "Storage cost is usually the main reason to limit the number of days to store"
"Cost of large storage RAID arrays needed with higher megapixel cameras and recording at 20 to 30 images per second." "Most often the limit is the cost of storage in a RAID environment"
"Storage costs are not often a major concern as drive prices are fairly low and many new cameras are much more efficient than previous models." "HDD sizes/prices make it so that shorter retention doesn't really save on costs all that much." "With storage costs dropping and compression improving, longer retention periods are just more attainable, and customers usually want more than less." "Typically cost, although storage is really a pretty inexpensive part of the equation so there's no reason to skimp." Hard drive cost per TB are certainly lower than 5 years ago (~50%) plus the rise of smart codecs which regularly reduce storage consumption by 50%+ help here. These are statistics of what integrators are using. One month is likely 'right' for most people but depending on your needs (e.g., are you bank that only gets reports of fraud 45 days later, etc. ), you might want / require longer storage. However, recording for less than one month is increasingly hard to justify in terms of the cost savings, especially as new installs use smart codec cameras, which based on our smart codec tests, we recommend. Comments (17) : PRO Members only. Login. or Join.